It is safe to say that the work we’ve been doing to create alternatives to landfill disposal has forced a change in the traditional waste industry. And it’s an industry that badly needs to change. One way that we’ve done this is to show people where their garbage goes, and what’s in it. We often take people on tours of our transfer stations, and show them what they think goes “away” after they leave their garbage on the curb. Most companies would never show the public what the folks at the Recology transfer station in San Francisco call “the Pit”. 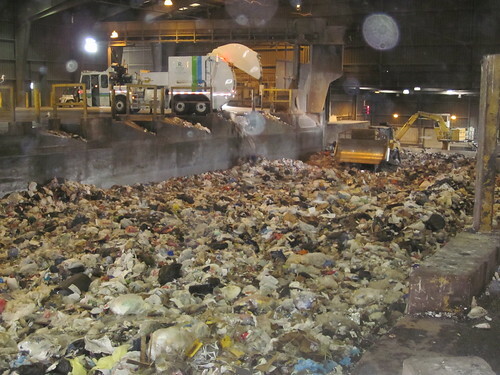 The Pit temporarily holds what goes into the garbage can before it’s transfered to a landfill. Most of it is recyclable or compostable. When we look at the pit, we feel the same sense of sadness that others feel when they’re exposed to it for the first time. There’s a lot of wasted material in there. We don’t hide the Pit for a reason. What folks see in there is an important part of their education about recycling, composting and landfills. And we show it to them for another reason too: to show them what they’re not seeing when they look at the Pit. Fifteen to twenty years ago, the Pit saw about 3,000 tons of waste per day. Today, the number is 1,350. We’ve been able to do this through our partnership with every resident of San Francisco and the Department of the Environment, and the three-bin system that we created, which allows everyone to sort out their compostable and recyclable material from their garbage. We participate in coastal and city-wide clean up days to make sure what can be recycled is recycled during those events, and try to inspire people to see garbage differently through our Artist in Residence program in San Francisco and GLEAN in Portland. Of course, there will always be garbage as long as products are made to be disposable after a single use, and as long as that is true, we will need landfills. But, we hope that the landfills of the future are “inert”–meaning no recyclable and no compostable materials go there. Coming up with new ways to prevent usable resources from being wasted is part of the joy in our jobs. For example, one of the employees at the Materials Recovery Facility (MRF) in San Francisco came up with the idea to recover BART tickets that still had some value and to use the proceeds to support Friends of the Urban Forest and the San Francisco Food Bank. We love that we get a chance to make a real, positive impact on the lives of people in the cities and towns where we work, and on resource conservation and the climate. It’s a tough and dirty job, but we are glad to do it. For a long time now I have had an idea related to this great blog post that is targeted towards the education of children for these very important waste management topics. In a nutshell, the idea challenges the “out of site, out of mind” mentality, helping kids think about what happens after they see things last. Similar to “what happens after you throw that in the trash?” things like “what do they do with all those T-shirts they made for the team that didn’t win the championship?” and “what happens to the newspapers/pastries/flowers/etc that didn’t sell today?” and even “what happens after you flush the toilet?” etc… I could go on and on. If children are taught to be more thoughtful in these ways, hopefully the lasting result will be less waste. I dreamed of creating a character that could present a question like these on a regular basis, and solicit responses for guesses about what happens as well as ideas for what could happen. Then similar to the wonderful “Reading Rainbow” old show (and this great blog post) show what actually does happen. I never chased that dream, but thanks to thought leaders like you I still have hope we can eventually become less wasteful consumers. Thanks for your passionate reply Julia. We take our work to heart and will see how we can make more kids aware that out of sight doesn’t mean out of mind.